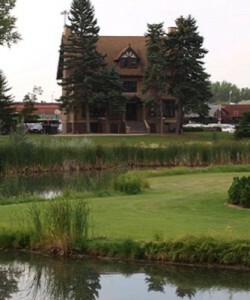 Grand Forks is a river town founded by riverboat captain Alexander Griggs, in 1872. Its first streets and buildings were oriented to the river and its traffic. 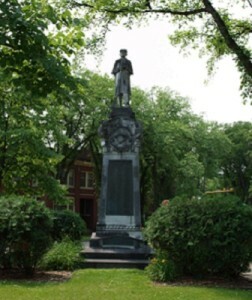 The story goes that when Griggs’ flatboat froze in at the confluence of the Red River of the North and the Red Lake River, he and his crew were forced to winter here. He decided this would be a good place for a town. 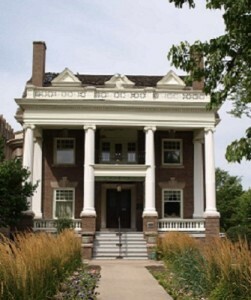 Long before, Native Americans and European trappers used the site as a meeting place and the ox-cart trails leading from Minneapolis to Winnipeg passed through the area. 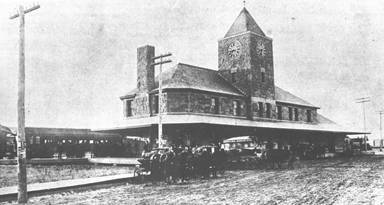 The town grew up along the river until the railroads arrived in the 1880s, causing westward expansion along the St. Paul, Minneapolis, and Manitoba tracks. Grand Forks became a transportation hub for merchandise going west and farm products going east. Buildings on North Third Street retain loading docks that once opened directly onto a spur line of the Northern Pacific Railroad. Lumber and brick yards, banks and land agents sprang up to support the growing community. 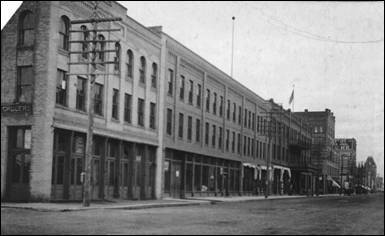 The downtown expanded from a few hotels and saloons to a full-fledged shopping district offering everything needed to set up housekeeping and clothe the family. 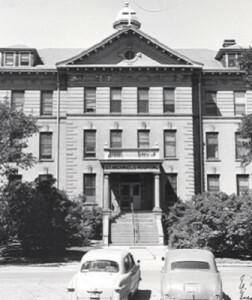 The University of North Dakota, established in 1883 just one mile west of downtown, provided another anchor for the young community. 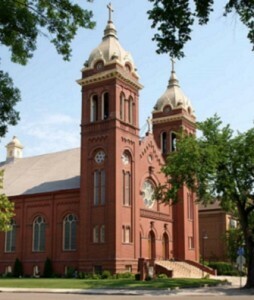 By 1900, Grand Forks had 7,652 residents! 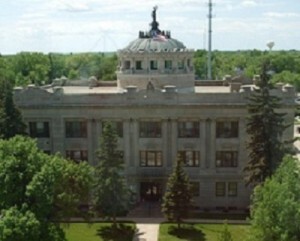 The County Courthouse was built to be as fire resistant as possible. 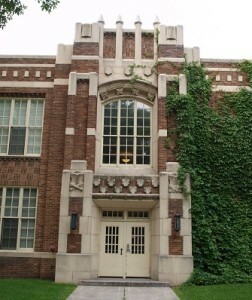 Metal doors and trim moldings were faux-painted to look like quarter-sawn oak. As this picture shows, it’s hard to tell faux from real! 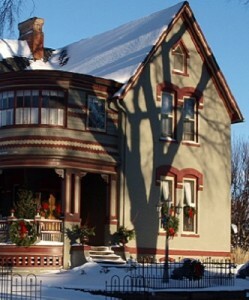 Major fires in the 1890s destroyed most of the early commercial buildings, resulting in the construction of many of the structures we retain today. The new buildings were made of brick to inhibit fire. There was enough new construction to support five local brick yards in the early 1900s. 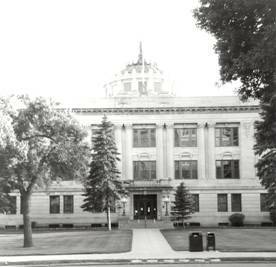 When the new County Courthouse was built in 1913, the concern for fire was so high that they substituted metal for woodwork throughout the building and then faux-painted it to look like quarter-sawn oak! Along with fire, flooding was a frequent hazard for Grand Forks. Low lying areas of the downtown and residential neighborhoods experienced annual floods. 1897 and 1950 were particularly devastating, but the dike erected in the early 1950s and the temporary dikes erected each spring were thought to be enough to control the river. 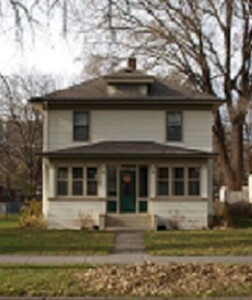 Grand Forks experienced continuous growth through the first half of the 20th century. Even the economic depression of the 1930s did not stop population growth as people from the surrounding area moved into town seeking jobs and assistance. 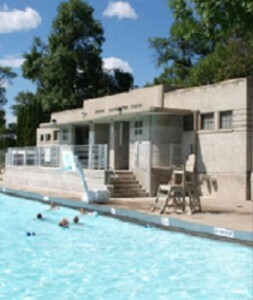 During these years, the center of community life remained in its downtown. 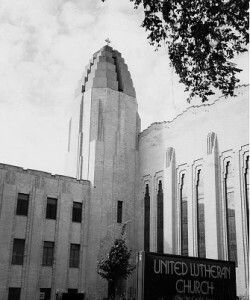 Shopping, movies, fraternal organizations and even churches were still located within a few blocks of each other in the heart of the city. Then, in 1959, Grand Forks’ first shopping mall opened on South Washington Street. It was a harbinger of things to come: malls, homes, churches and schools grew up to the south and downtown began its decline. Much of the growth could be attributed to the selection of Grand Forks as the site of a new Air Force base. 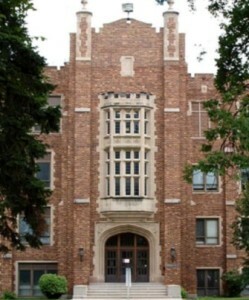 The Grand Forks Air Force Base was fully operational by 1966. It brought thousands of officers, airmen and women, and their families to the city. The influx stressed the support services of the community but also expanded the economic base, enabling those needs to be met. The air base, fifteen miles west of the city, has proven over and over again, to be a good neighbor, a friend in times of need. In 1997, when the raging Red River broke through the temporary dikes and inundated the city, community members, university students and base personnel fought together to hold back the water. However, at 54.35 feet, Grand Forks experienced the worst flood in its recorded history. The dikes broke, the city flooded and more than 50,000 residents were evacuated in the largest single-city evacuation in the United States since the Civil War. Grand Forks has largely recovered from that flood. With funding assistance from our federal and state governments, the careful oversight of local officials and city staff, and the outpouring of help from countless individuals and organizations, Grand Forks found its way back to normal.